More than 20 inorganic mineral elements are essential for optimum metabolism in fish and shrimp. These are usually classified into macro elements and micro elements. Minerals required in considerable quantities are termed Macro-elements and those required in lesser amounts are referred to as Micro-elements (Trace Minerals). These minerals are the co-factors in several metabolic activities and play pivotal role in growth and immunity of aquatic animals. 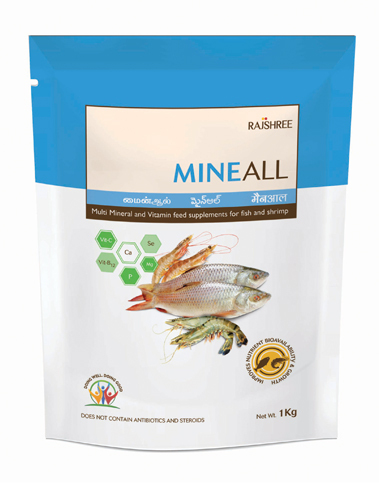 MINEALL provides all the essential minerals required for the optimum growth potential of fish and shrimp. Dietary requirement of fish or shrimp species for a particular element to a large extent will depend upon the concentration of that element in water body. So presence of minerals in surrounding water plays a major role in determining the growth of shrimps and fishes. Further this also improves amount of phytoplankton and zooplankton present in the water. Higher plankton levels mean higher natural productivity leading to lower feed conversion ratio. 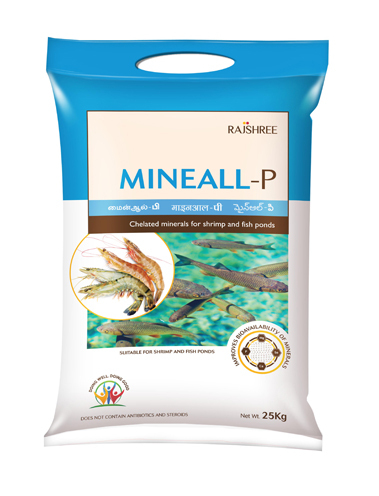 Chelated minerals present in MINEALL P are absorbed effectively in fish and shrimp with higher bioavailability.